Get the new issue of MOJO for Joni Mitchell's '70s jazz-inspired ascent. Plus: inside the Metallica bassist's new documentary about her wild genius sideman. HAVING ACHIEVED REGAL status amongst her folk-rock contemporaries, between 1975 and 1979 Joni Mitchell created a quartet of astounding albums that leaned heavily on jazz improvisation. In the new issue of MOJO (April 2016 / #269), on sale in the UK now, David Fricke investigates this quest for creative freedom that yielded The Hissing Of Summer Lawns (1975), Hejira (1976), Don Juan's Reckless Daughter (1977) and Mingus (1979) via a series of new interviews with the musicians involved in their creation. One of the key collaborators in that era, late bassist Jaco Pastorius, is the subject of a new documentary by Metallica’s Robert Trujillo. Trujillo has spoken to MOJO about Jaco’s contributions to Mitchell’s music ahead of a UK screening for his labour-of-love. 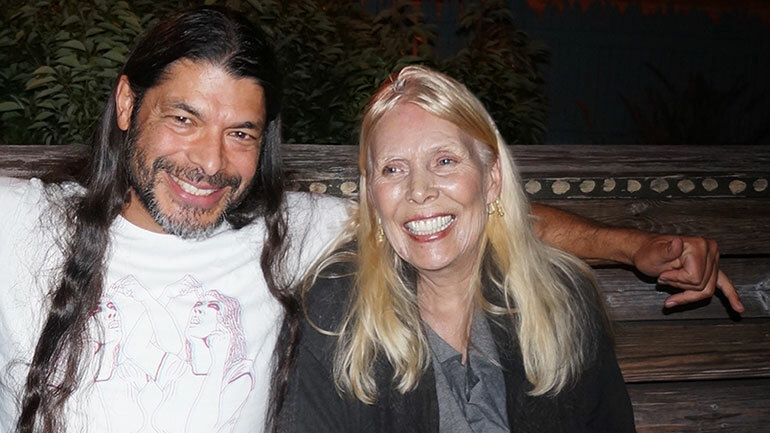 “I’d always appreciated Joni Mitchell’s music but then I heard what she’d done with Jaco as collaborator on Hejira, Don Juan’s Reckless Daughter and Mingus,” the metal bassist explains. Get MOJO now for the full feature on Joni Mitchell, plus the interview with Metallica’s Trujillo whose film, Jaco, will be screened during the London Bass Guitar Show at London’s Olympia between March 12-13.